At this stage of the painting, I used a very wet wash of Prussian Blue in the back-middle area. 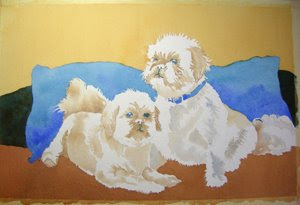 I applied the blue, and as it was drying I applied wet drops of VanDyke Brown to the wash. This created a really nice, dark value that had some depth to it. Do not over-blend or over-brush! Allow the pigments to run and blend together as they will, but don't force them to blend completely. Too much blending is what makes watercolor "mud".